KARACHI: The index might offend the overly patriotic but is hardly surprising. Pakistan is one of the weakest countries in the world, and now has an index assigned to it — fragile state. Pakistan ranks 10th in the Fragile States Index released by the Peace Fund earlier this year. India ranks 81. According to another report, “Fragile States 2014: Domestic Revenue Mobilisation” produced by the Organisation for Economic Co-operation and Development (OECD) in February, the cause is a non-functional domestic revenue system — the failing tax system. The Pakistani government spends a meagre 0.7% of its GDP on health, which is less than half of what other governments in lower middle-income countries spend. National expenditure on elementary education is less than 2%. The OECD reports that progress towards the Millennium Development Goals (MDGs) in fragile states is expected to be much slower compared to other countries, and in five years, extreme poverty is expected to be concentrated mainly in fragile states. Pakistan, thus, has much to worry about. Accountable tax systems are of greater importance in fragile states compared to other countries. While domestic revenues help countries get rid of aid dependency and building mutual accountability between citizen and state, as the report states, Pakistan’s Federal Board of Revenue (FBR) collects a mere 9% of Pakistan’s GDP. 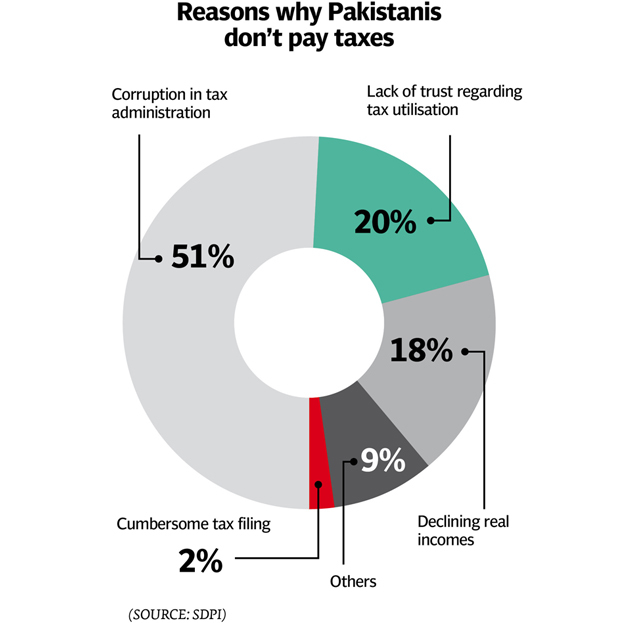 This is among the lowest rates of tax collection by a federal government in the world, excluding oil-producing countries, according to a study of tax reforms in Pakistan by the SDPI. “With a non-trustworthy system, people have no incentive to pay taxes. There are too many loopholes in the system due to which the richest end up paying the least tax,” explained Shehzad. 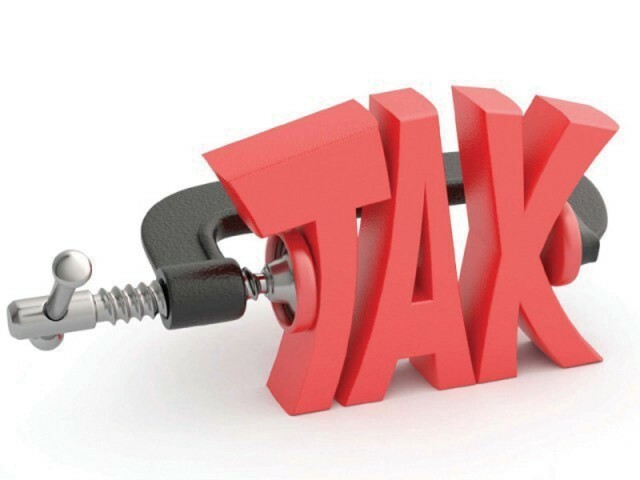 Exemptions made by the government to certain taxpayers are provided in the tax laws, and through a ‘Statutory Regulatory Order’ (SRO) issued by the FBR. To date, the FBR has issued 1,920 SROs. An estimated revenue leakage of 3 to 4% of GDP is due to taxpayers not paying taxes on time, and revenue loss resulting from preferential treatment. These losses, in 2012, were estimated at between Rs600 and Rs800 billion, and if tax evasion is added, total loss roughly equals the total government borrowing each year. The business community also seems to disagree with how the SROs are used. Recently, the business community of Rawalpindi unanimously rejected SRO 608, demanding that the government withdraw it within a week. The demand came a day after the Directorate of Customs Intelligence and Investigation unearthed evasion of duties and taxes of Rs775 million by importers who misused SRO-1125 of 2011. “There is immense discrepancy in sources of taxes. Tax we earn from the agriculture industry is non-existent,” said Shehzad. If Dr Vaqar is to be believed, this situation is not going to change anytime soon. “In a country where a quarter or more of our national income comes from agriculture, its income is outside the tax net. The feudal benefits from this – the same feudal who is sitting in parliament. Therefore, every time this matter is taken up in parliament, it is silenced,” said Dr Vaqar. Published in The Express Tribune, October 23rd, 2014. Posted in Pakistan and tagged fragile states, OECD, Pakistan, SDPI, Taxation, UN Foundation. Bookmark the permalink. KARACHI: In a cramped two bedroom house in Dalmia, Karachi, Asadullah Sheikh lives with his 5 children, mother and wife. This is his sixth year in Karachi. Previously, Shaikh was a smallholder farmer and owned 11 acres of land in Sajawal.The artificial price hike of agricultural lands between 2005 and 2007 tempted Shaikh – like many other farmers- to move to the city. He sold his land, got enough money to buy a motor cycle, paid his debts, set up a small kiryana store and made Karachi his home. “My 11 acres are lying uncultivated,” he says with a tinge of remorse. Sheikh is one of those who form Pakistan’s growing urban population, making Pakistan a country with a very rapid urbanisation rate. A 2008 report by UN Population Fund reported that the share of the urban population in Pakistan almost doubled from 17.4 per cent in 1951 to 32.5 per cent in 1998. More than 60% of the population of urban Sindh lives in Karachi, which according to a “City Mayors 2011 survey” has become one of the largest cities in the world with a population of 15.5 million, with other estimates claiming it may be 18 million. While city-dwellers complain about how cities are becoming crowded, the reasons for this urbanisation are hardly understood. Tariq Bucha, President of Pakistan Farmer’s Association, while talking to The Express Tribune, says that 85 to 87% farmers of Pakistan live below the subsistence level, which means they own less than 12 and a half acres. “Inheritance laws are an important factor here. Every time a person dies, his lands are divided into smaller shares among his children. Small pieces of land are economically unviable. In an absence of a marketing infrastructure and access for our farmers, the most attractive option for them is to sell the 3 to 4 acres they have, and move,” said Bucha. In the 36th Governing Council of the United Nations International Fund for Agricultural Development (IFAD), held in Rome in February, agency President Kanayo Nwanze reminded partners that a boom in agriculture can prompt twice more growth in an economy. “The emergence of higher and more volatile food prices, combined with dramatic droughts, floods, and famines, have concentrated world attention on the question of how to feed a global population that is over 7 billion and growing. Today, agriculture is centre stage,” Nwanze said. In 2008, the world’s urban population exceeded its rural population for the first time. UN projections suggest that the world’s urban population will grow by more than a billion people between 2010 and 2025, while the rural population will hardly grow at. According to the research paper “Urbanisation and its implications for food and farming” (David Satterthwaite, Gordon McGranahan and Cecilia Tacoli), it is likely that the proportion of the global population not producing food will continue to grow, as will the number of middle and upper income consumers whose dietary choices are more energy- and greenhouse gas emission-intensive (and often more land-intensive) and where such changes in demand also bring major changes in agriculture and in the supply chain. While urbanisation is seen as a sign of progress, this research says that with urbanization, there will be rising demands for meat, dairy products, vegetable oils and ‘luxury’ foods, and this implies more energy-intensive production and, for many nations, more imports. Also, dietary shifts towards more processed and pre-prepared foods, in part in response to long working hours and, for a proportion of the urban population, with reduced physical activity, affects the agricultural supply chain. “This trans-shifting has effects on demand of crops. Who eats jawaar (millet) and baajra (sorghum) now? We are moving away from organic food to synthetics,” says Bajwa, commenting on how city dwellers’ food choices indirectly result in mass exodus from villages to cities. Published in The Express Tribune, March 2nd, 2013. Posted in Human Rights, In The Loop, Pakistan and tagged iFad, IPS, SDPI, Slow Food, Trust Media, urbanization. Bookmark the permalink.